This option can help to clone partition and volume directly to other places. It can clone the system drive as well as the drive that includes the applications without reinstallation. AOMEI Backupper provides the feature to clone a single partition rather than the whole disk. For example, the (C:) drive could be cloned to (D:), or (E:) could be cloned to another disk. 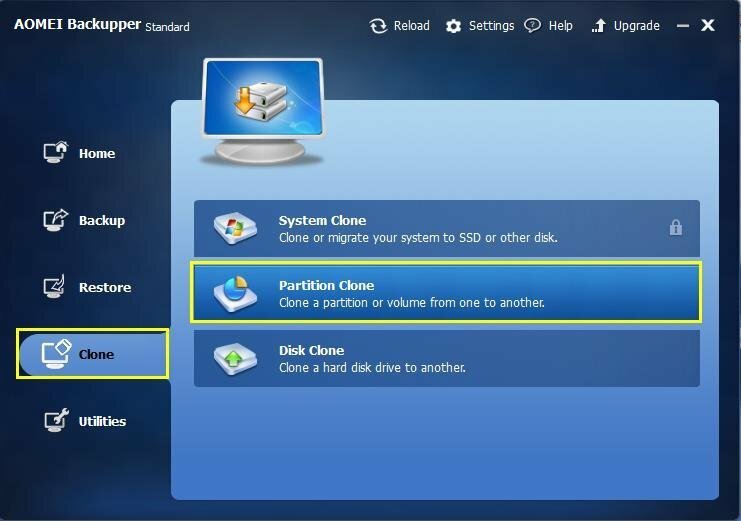 In the left Tab page, select the Clone option, and then select Partition Clone. Select a partition or volume you want to clone as source partition and click Next. Select an appropriate unallocated space or an existing partition as destination partition, and click Next. Copy without resizing partitions: Do not do any changes. Edit partitions on this disk: Manually adjust the partition size and location by dragging a slider bar. Sector by sector clone: Copies all sectors of the disk to destination disk whether in use or not. The destination disk size must be equal to or larger than the source disk. Align partition to optimize for SSD: If your destination disk is SSD (Solid-State Drive), we highly suggest you to tick this option for optimizing the performance of SSD. Finally, click Start Clone. Wait for the process to complete and then click Finish. A disk clone can take several hours depending on the size of the source disk. For more detail, see: How to Do Partition/Volume Clone. 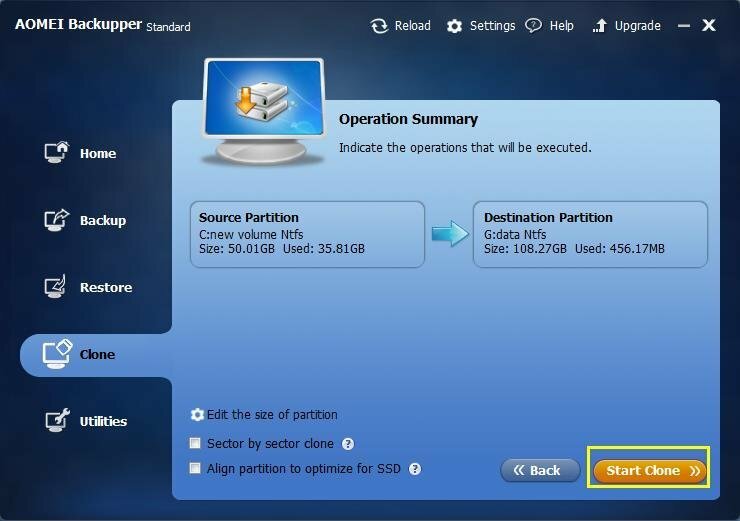 The source partition cannot be selected as a destination partition. Note that the destination will be overwritten. Therefore if it contains any important data, you must backup the destination before you apply the operation. If the destination is locked by other programs or applications running on it, AOMEI Backupper will ask to restart the computer, and will execute the partition clone operation in a "Restart Mode".